24 items found searching fields on 2 pages. Learn the basic fundamentals of restaurant economics and how to make your restaurant more successful with this DVD by the Culinary Institute of America and Gregory X. Norkus, Senior Lecturer at Cornell University's School of Hotel Administration. Focus on the interplay among the three key activities of a restaurant: marketing, operations... more. Featuring the expertise of Chef Richard Coppedge, Gluten-Free Baking offers clear and easy-to-follow directions for preparing several items featured in the CIAs Gluten-Free Baking book. Employing Chef Coppedge's five flour blends, you will learn to make delicious baked goods using alternatives to gluten. You'll also learn to prepare molte... more. American lamb offers a wide range of culinary possibilities no matter the foodservice venue. 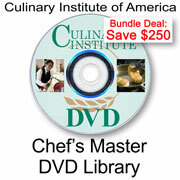 This DVD from the Culinary Institute of America, with an accompanying training manual, will help you to better prepare your students or staff on this underutilized protein. Topics include presenting lamb as an entree or appetizer, classes, quality... more. Discover the versatility of the "other white meat." Pork: Beyond the Chop Foodservice Learning Solutions DVD by the Culinary Institute of America, with an accompanying training manual will assist in educating your students and/or staff on this popular versatile protein. Discover the versatility of the "other white meat". Uncover the m... more. In this series of three DVDs from the Culinary Institute of America, learn the detailed methods and creative design concepts for preparing luscious pastries and spectacular sugar and chocolate showpieces that your customers will long remember. This comprehensive series will show you how to fully satisfy your customers' sweet tooth.... more. Classic cooking methods are the bedrock of the successful and innovative culinary professional. Deepen your understanding of the all-important cooking fundamentals with this first of a series of three Cooking Methods DVDs by the Culinary Institute of America, Dry Heat Volume 1 (Grilling, Broiling, Roasting & Baking) ... more. Classic cooking methods are the bedrock of the successful and innovative culinary professional. Deepen your understanding of the all-important cooking fundamentals with this second of a series of three Cooking Methods DVDs by the Culinary Institute of America, Dry Heat Volume 2 (Sauteing, Pan/Deep/Stir Frying)... more.